To recap: Below are the results of the May 20 non-partisan school board election, at which all seven school board seats were up for election (with the two super district seats being eliminated). Four seats were secured and three will continue on in the runoffs. District 3: In a five-person race for this seat, the result is now a runoff between incumbent Michael Irwin (a Gov Deal appointee) and Atticus LeBlanc (a parent and community member). Willie R. Mosley, Jr., Jarrod Jordan and Jerrie D. Bason were the other candidates. 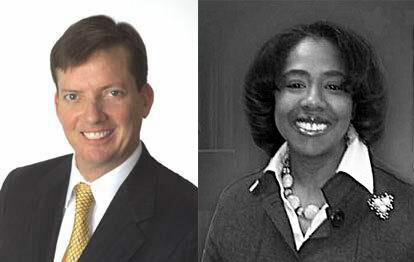 District 4: After a four-person race for this seat, the result is now a runoff between two incumbents: Jim McMahan, who was originally elected by the district 4 voters, and Karen Carter, a Gov Deal appointee to the super district seat formerly held by Pam Speaks, and eliminated by the GA legislature this year. The other candidates were John Oselette and Ella Smith. District 5: After a 5 person race for this seat, formerly held by Gov appointee David Campbell who chose not to run again, the result is now a runoff between incumbent Thad Mayfield (a Gov Deal appointee) and longtime educator Vicki B. Turner who serves as headmaster of a small private school. District 6: Current board chair, incumbent Melvin Johnson won handily over Bridgeman Bolger. District 7: Joyce Morley won easily with over 60% of the vote against two other candidates, Kim Ault and Lee V. Dukes. Two incumbents will compete on July 22 for the District 4 DeKalb school board seat: Jim McMahan, who was originally elected by the people of District 4 and Karen Carter, who lives in District 4 and was appointed by Gov. Deal to the Overlay District 9 seat (now eliminated by the GA Legislature). I have a background in Financial Services for the last 29 years. Investment Advisor with Dean Witter Reynolds & Morgan Stanley and since having children 14 years ago I have worked as a Residential Loan Originator currently with Amstar Mortgage Network. I spend hours reviewing the district financials every month and propose ways to increase transparency and create efficiencies. I am a taxpayer advocate and parent who understands the challenges our teachers and students face each day in our schools. I am not a lifelong administrator as one of my challengers who voted against the Druid Hills Charter Cluster. I support local control and look forward to establishing a “Charter System” within DCSD. Several issues challenge our district. Underfunded schools and teachers are first. The lack of local control of our schools and clusters and a Superintendent that is a strong, transformational leader. I am part of the team appointed to recommend the process to search for our next Superintendent. I suggest ways to increase funding to our schools and teachers and offer policy amendments to help move forward in creating a charter system. To read the entire interview with Jim, click here. I am an educator who has served in senior administrative roles in higher education as well as on the faculty. In these positions I have gained a greater understanding of coalition building, demonstrating compassion for others while working on challenging issues and engaging diverse stakeholders. I am also a licensed attorney with more than twenty years of experience working with non-profit boards as a trainer, board chair and member, I am a consensus builder and systems thinker who can see the big and little pieces of an issue and help others understand how they contribute to resolving the issue and moving the mission forward. I believe that these skills as well as my commitment to helping others achieve their best have allowed me to work with all board members to move this school district forward in achieving academic success and respect. I was appointed by Governor Deal to serve the district last year and I believe I was selected because of the combination of my professional skills, history as a servant leader, and my diverse K-12 experiences. While the appointment allowed me to work with others to begin creating positive change for the district overall, the work is not complete. The short term successes we have achieved continue to fuel my passion for ensuring that all children receive a high quality education. I believe that what makes me unique in this group of candidates’ is that I am a non-parent whose life work has been the advancement of education. As such I represent the voice and vision of the reasonable citizen without children at home who still wants to make a difference. Like others, I support education through taxes, personal engagement and service. To read the entire interview with Karen, click here. DSW Note: Many thanks to WABE 90.1 Atlanta’s National Public Radio station for taking the time to post interviews with the candidates. You may also like to reread our post about the candidates originally written for the May election, DeKalb County School Board Candidates up for election on May 20, 2014: A Review. As pointed out by another comment on this blog, Ms. Carter is a nice and personable. However, she voted against the Druid Hills Charter and appears to want to maintain the status quo. I strongly believe that we need to move in a new direction and, while the DHCC may have not been ideal, it did move in a new direction and offered hope for improvement. The status quo is bad for all students in Dekalb County. Just look at the test scores, declining enrollment (especially in South Dekalb), and the teacher-administration issues. The status quo cannot and will not improve student outcomes and only serves to maintain a power structure for administrators. Jim McMahan was not my first choice, but he did support the DHCC. Let’s hope those who favor the Druid hill Charter Cluster proposal that was approved by 92% of the parents and teachers come out in droves and vote for those who support it. District 3: Michael Irwin sends his children to a charter school in north DeKalb, but does NOT support the Druid Hills Charter Cluster. [Irwin’s] child attends a charter school, but he may vote to keep your children from attending one. Irwin was an unelected appointee with the right connections to the governor. Atticus LeBlanc sends his child to the Museum School, a charter school in Avondale Estates and he supports the Druid Hills Charter Cluster and believes the future of DeKalb education probably will be in going the charter route. District 4: Jim McMahan, legally elected by District 4 and the true incumbent from District 4, supports the Druid Hill Charter Cluster. Karen Carter does not — and she uses the same flawed and selfish reasoning as Irwin. Karen Carter is NOT really an incumbent. She was appointed by the governor and her at-large district was eliminated by law. She apparently lives in District 4, but she is NOT the District 4 incumbent. She was an unelected appointee to a now-defunct district with the right connections to the governor. District 5: Does Thad Mayfield support charters and the innovative Druid Hills Charter Cluster? We are not so sure. He seems to be an opportunist voter who waited to vote until he knew which way the vote would go. Mayfield is part of the deeply entrenched Mayfield friends-and-family clan. His opponent, Vickie Turner, supports the community’s interest in charters and, if elected, likely will support Druid Hills charter Cluster at the next vote. District 5 deserves legally elected representation, not someone who is an incumbent only because he had the right connections to the governor. For complete information go to Don McChesney’s “insight into DeKalb Schools blog,” Don for DeKalb. The continued improvement of student achievement through the implementation of policies and a sustainable budget that equips teachers to deliver high-quality and differentiated instruction. The continued improved financial management policies and procedures and, last but not least, the recruitment and hiring of a superintendent. The more important question is how do we accomplish this as fast as we can? The superintendent held several meetings throughout DeKalb this past year and the taxpayers and stakeholders have spoken loud and clear. Taxpayers demand and deserve local control and governance over their community schools. They also deserve the per-pupil resources earned equally by all the children of DeKalb to be allocated to the schools and the teachers, not the central office. Karen Carter quote from the February 8, 2014 BOE retreat. One: Nobody is measuring the effectiveness or quality of senior staff. Two: Saying holding the staff accountable leads to a place “where people go to jail” is just stupid and meant to be intimidating. If you like the status quo and support the friends and family network, vote for Karen Carter. “That” is the most nonsensical statement ever. What on earth is she talking about? I attended the public event with both candidates held by the Smoke Rise Community Association last Wednesday. If I hadn’t been following the BOE closely over the last 15 months I would not be able to make any distinction between the candidates. They say the same things, they have voted the same way except 2 or 3 times when Jim voted in the minority of something. The difference I have observed during public meetings is McMahan asks some questions and seems to have prepared for the meetings, whereas Carter doesn’t ask any questions, doesn’t say much of anything, and has appeared unprepared (unfamiliar with the topic) when she does speak. For example, last year when the Tapestry Charter petition was first brought before the board, it was delayed because several board members, including Carter, “had concerns.” Their concerns were addressed in the petition. When those board members actually read the material, they couldn’t say enough good things about Tapestry.